You’d imagine, as a restaurant owner, the most you’d have to worry about is whether people liked your food – and the food hygiene rating (obvs). What you probably wouldn’t expect to have to worry about is the name of your restaurant. After all, how could people possibly have a problem with ‘Bob’s Burgers’ or ‘Subway’? 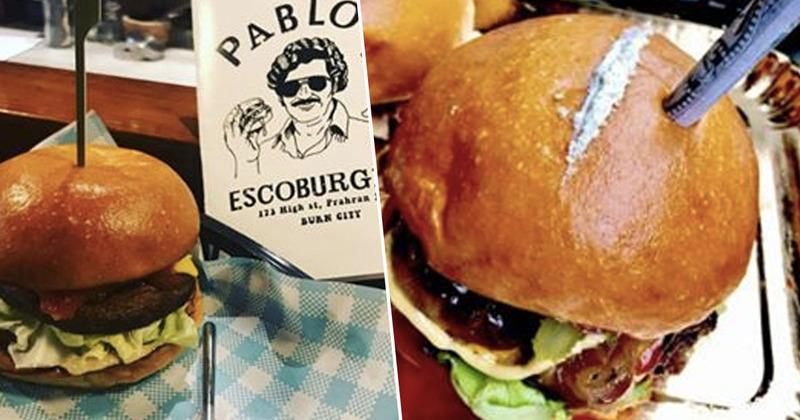 If you name it after the most notorious drug lord in history though, it’s likely to cause a fair bit of controversy – as Pablo’s Escoburgers in Prahran, Melbourne has recently found out. 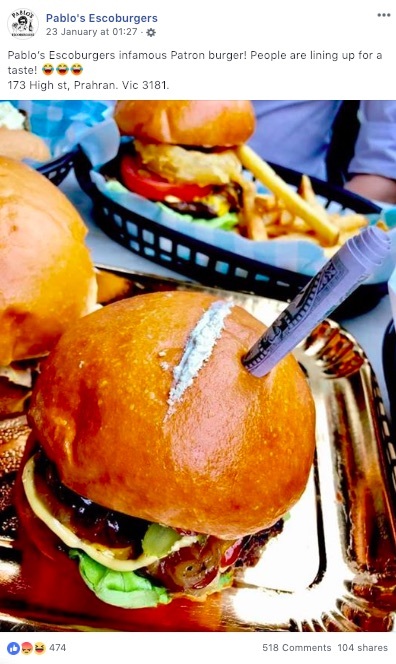 Since opening its doors, the pop-up restaurant has caused controversy with its range of burgers – in particular its ‘Patron Burger’ – which comes complete with a line of white garlic powder on the bun (to resemble cocaine), and a fake rolled up $100 note. The burger is served alongside a plastic bag filled with more garlic powder, complete with a silver spoon. A clear homage to the infamous Pablo Escobar, the burger has not been received well by the general public. So much so, people have hit out at the restaurant owners, saying they’re ‘glorifying’ drug addiction and joking about its consequences. Owner Vaughan Marks has denied these claims though, stating the restaurant name is just a ‘play on words’ and he doesn’t want to glorify the notorious drug lord in the slightest. There has always been a fascination for films like Blow or Scarface, so we thought that the name we gave to our business could be appropriate, and the name is a point of difference. It’s not his name, Pablo’s Escoburgers is just a play on words, I do not defend Pablo and I do not want to glorify him, I think he was a horrible person, but it occurred to us to play with words, because it sounded funny, but this does not mean that Pablo is funny or that everything he has done is funny. 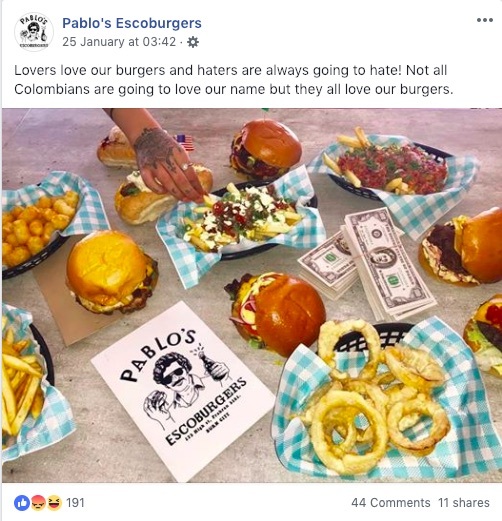 The owner went on to say he’ll only change the name of Pablo’s Escoburgers on one condition – if those against it raise $100 million for a charity of their choice. If it hurts so much and they want us to change the name, then let’s do it for a reason. If we can gather all those who are against the name, and work as a team to raise $100 million for a charity of their choice, then if we can raise that amount of money, we will change the name, that makes sense to me. Let’s make this pain worthwhile and let’s help a charity that can solve a problem in this world. Which, let’s face it, is almost definitely not going to happen so we can expect to see more of the escoburgers in our lives in the coming weeks. So what do you think? Is this all just a bit of harmless fun, or an insensitive glamorisation of a dangerous individual? If you want friendly, confidential advice about drugs you can talk to FRANK. You can call 0300 123 6600, text 82111 or email from 2pm-6pm any day of the week.